Recently I have decided to have a little overhaul of my skincare routine. I have stuck with Cetaphil as my morning cleanser, Sanctuary Hot Cloth Cleanser as my evening one, and Micellar solution to remove my makeup, but there are a few steps surrounding those that needed a little change. I mentioned in an empties post a while back that I wasn't enjoying the Cetaphil Moisturising Lotion as my facial moisturiser anymore, and since finishing my Roaccutane treatment I have tried several other day moisturisers, all of which haven't really felt right. They were either too dry or too slick, they left me oily or clogged my pores, some even gave me an allergic reaction. 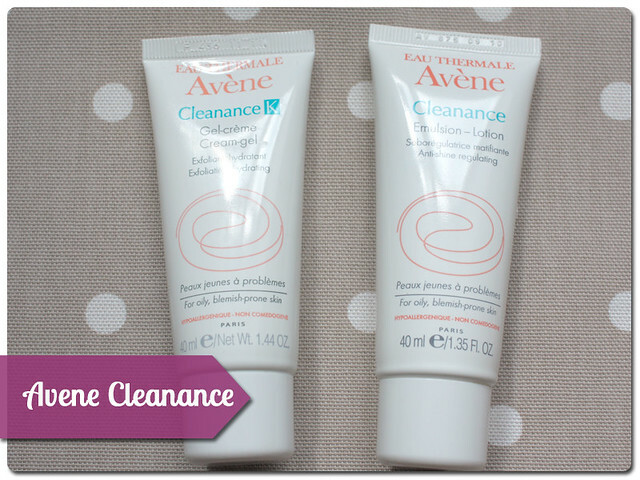 I was getting a bit frustrated by it all when I walked into boots and decided to have a look at some French pharmaceutical brands, ones which were more into treating sensitivity as well as other complaints, and I settled on Avene. I picked up a mattifying cleanser, the Cleanance Anti-Shine Regulating Lotion, and a chemical exfoliant the Cleanance K, both of which are highly recommended by various YouTubers and Bloggers. The moisturiser is described as a lotion, but is more of a gel formulation, as is the exfoliator. This means that they both feel incredibly light and don't leave my skin feeling tacky, a big no no for me. Both products are specifically targeted to reduce oil by drawing it away from the skin and trapping it in special microcapsules within the formula, and the exfoliant uses both glycolic and salicylic acids to get rid of dead skin cells that cause clogged pores in the first place. I have been using both for a few weeks now, and I have noticed a big difference in the amount of oiliness I get during the day, especially on my forehead which is a real problem area. I haven't noticed a huge difference using the exfoliator, but I have to admit I haven't been religious about applying it, it does recommend you use it every evening, but I have used it on average once a week. I will be more strict with myself from now on and see if I can spot any noticeable changes. I don't think I would completely swap from a physical exfoliant to a chemical one, but careful combination of the two within a set routine would be ideal I believe, and is something I hope to achieve. Both of these products cost £10.50 for 40ml, not cheap when you consider they are to be used every day, but as they are available from Boots there is always the chance to say a bit of money with an offer. Have you tried Avene before?